Osteosarcoma and Ewing’s sarcoma are the most common malignancies of bone tissues in children. Osteosarcoma, the more common of the two types, usually presents in bones around the knee. Ewing’s sarcoma may affect bones of the pelvis, thigh, upper arm, or ribs. Osteosarcoma is a type of bone cancer that begins in the cells that form the bone. Osteosarcoma occurs most often in the long bones of the arms and legs. Osteosarcoma is a bone tumor that occurs predominantly in adolescents and young adults. Our bones come in two main types: “flat” and “long”. Flat bones help protect the brain and organs; long bones sport the legs and arms. Osteosarcoma usually develops at the edges of the long bones, in the “metaphysis”, which is the name for the growing ends of the bone. Most of these tumors develop in the ends of the long bones that form the knee. The second most common site for these tumors is in the ends of the upper arm bone close to the shoulder. They can also be found in other places, like the pelvis, shoulder, and skull. 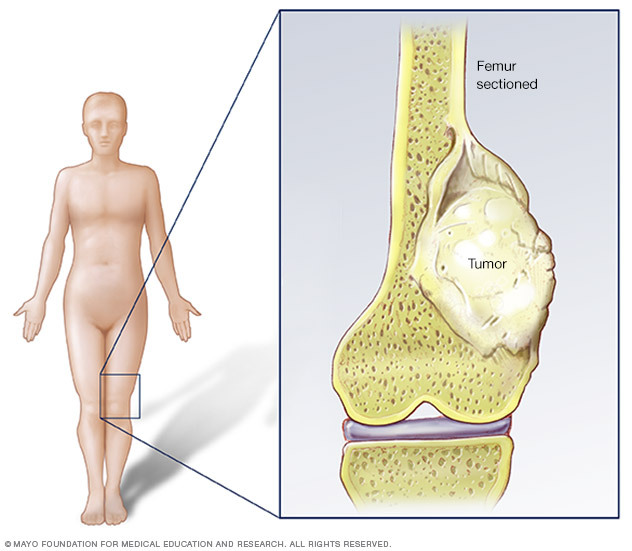 The World Health Organization’s (WHO) classification of bone tumors separates the osteosarcomas into central (medullary) and surface (peripheral) tumors and recognizes a number of subtypes within each group. NCI site on cellular classification of osteosarcomas. Osteosarcoma is treated with surgery and multi-agent chemotherapy. It is very important that patients are evaluated by an orthopedic oncologist who is familiar with the surgical management of osteosarcoma. This evaluation (including imaging studies) must be done prior to the initial biopsy, since a botched biopsy may jeopardize a limb-sparing procedure. Patients with osteosarcoma should undergo surgical removal of the tumor if possible. The type of surgery depends on a number of factors, such as limb-sparing or replacement with prosthetic devices that must be evaluated on an individual basis. Chemotherapy can include high-dose methotrexate, doxorubicin, cyclophosphamide, cisplatin, ifosfamide, etoposide, and carboplatin. Askin’s tumor (PNET of the chest wall). Ewing’s family of tumors most frequently occurs in teenagers. It can occur in any bone in the body, but it is most common in the pelvis, thigh, lower leg, upper arm, and rib. Dr. James Ewing who described the tumor in the 1920’s distinguished the tumor from osteosarcoma on the basis that it was responsive to radiotherapy. More information on Ewing’s on the NCI web site – note that you can toggle back and forth between “Health Professional” and “Patient” versions. Ewing’s family of tumors is treated with multi-agent chemotherapy, radiation therapy, and/or surgical removal of the primary tumor. Chemotherapy can include vincristine, doxorubicin, and cyclophosphamide altering with ifosfamide and etoposide. It is important that Ewing’s patients are evaluated by specialists immediately after diagnosis from all disciplines including radiologists, chemotherapists, pathologists, surgeons or orthopedic oncologists, and radiation oncologists. As in osteosarcoma, a team approach is necessary, especially if limb-sparing procedures are planned. You will be given more choices (e.g., type of cancer and type of trial). Choose the appropriate responses and click search. Bone pain is the most common symptom. Sometimes a lump can be felt on the bone, or the tumor will interfere with normal movements. What often happens is that a child injures themselves while playing, and the pain persists long after the injury should have healed. Parents assume that the pain is from a broken bone and take the child to the doctor for evaluation, at which time X-rays reveal a bone tumor. The Liddy Shriver Sarcoma Initiative: This patient-generated web site contains a wealth of helpful and practical information on treatment for sarcomas. Cure our Children Foundation: Helpful information and links on the subject of Ewing’s Sarcoma. Osteosarcoma Online from the Indiana University Melvin and Bren Simon Cancer Center.